Innovation in cuisine that started in Minneapolis heads for New York with the Celebrity Chef Tour 2012. LAS VEGAS ( MainStreet) -- James Beard Foundation winners and Minnesota chefs converged on Tom Colicchio's Riverpark for a culinary delight Wednesday -- the New York stop on the Celebrity Chef Tour 2012, benefiting the James Beard Foundation. Award-winning chefs Sisha Ortuzar (of Riverpark), Andrew Zimmern (of Bizarre Foods with Andrew Zimmern on The Travel Channel), Tim McKee (of La Belle Vie and Sea Change), Isaac Becker (of 112 Eatery and Bar La Grassa), Alex Roberts (of Alma and Brasa), Gavin Kaysen (of Cafe Boulud) and Angie Lee (also of Riverpark) were on hand to deliver this once-in-a-lifetime multicourse dining experience. Here guests had the rare opportunity to interact with the chefs through the evening while dining on an exquisite seven-course menu complete with wine and beer pairings. The idea for the venue began when Kaysen and Zimmern wanted to create a dinner and bring Minnesota to New York City, as both chefs had lived there at one time. Kaysen and Ortuzar were at Riverpark restaurant one night when Kaysen decided it was the ideal venue to have a dinner beginning in the farm. Ortuzar developed the concept for Riverpark and the creative vision for the menu. Riverpark sits by the East River, amid the skyscrapers of Manhattan. Known as New York's "most urban farm," the Riverpark Farm at Alexandria Center supplies fresh, local produce to the restaurant. 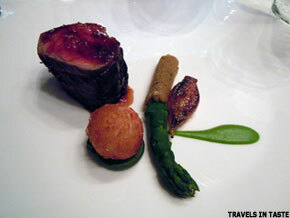 A dry-aged ribeye steak is served with asparagus, bone marrow and sauce au poivre by Gavin Kaysen of Cafe Boulud. TravelsinTaste was on hand for the evening, which began with a reception amid the farm's local produce. Passed hors d'oeuvres ranged from Zimmern's goat tartare to Becker's fried bread with Le Quercia Rossa prosciutto and Minnesota honey to McKee's Star Prairie trout, foie gras and smoked trout roe, among other delights. Wines from Chateau Ste. Michelle, Russian River Ramey Cellars, Rodney Strong and Davis Bynum and beer from Stella Artois quenched guests' thirst. The seven-course, sit-down dinner commenced with host chef Ortuzar's summer squash salad with goat cheese and chiles. Otuzar's collaboration with Colicchio began in 1997 at Gramercy Tavern. He joined Colicchio in the founding of Craft and the Craft Restaurant Group and also created the 'wichcraft concept. Now he focuses on Riverpark. Zimmern did not serve live octopus or armadillo pie -- some of the delicacies you might see him indulging during his shows. Instead, his creation was a giant Pacific clam crudo coupled with Ty Ku sake. Next up was McKee, a name you've heard if you've spent any time in the Midwest food circuit, as he has opened six of the most well-received restaurants in the Twin Cities, including La Belle Vie and Solera. The James Beard Award-winner for best chef in the Midwest in 2009 has a restaurant repertoire that also includes Sea Change, Smalley's Caribbean BBQ and Barrio. But instead of barbecue he dazzled with a sauteed branzino with whipped brandade, artichoke, black olive and dill. Meatballs, you say? How could they be a part of an exquisite culinary experience? If you're asking you haven't tried Isaac Becker's tagliatelle with foie gras meatballs, one of the runaway hits of the evening. Why would it not be? His 112 Eatery lies amid the arty, eclectic Minneapolis warehouse district and redefines "mom and pop eatery." A favorite of industry insiders, it redefines fine dining without the formality. Alex Roberts followed. A veteran of New York City's Gramercy Park, Bouley and Union Square Cafe, Roberts spent his formative years in Minneapolis kitchens. He's since returned to Minnesota, reaffirming his commitment to sustainable, locally grown organic food by opening Alma and Brasa Premium Rotisserie. His grilled quail with marinated shiitakes and sweet potato was paired perfectly with a Domaine Serene Rockblock "SoNo" Syrah NV from Stella Artois, one of the sponsors of the evening. Meanwhile, Gavin Kaysen, executive chef of Cafe Boulud in the chic boutique hotel The Surrey in New York's Upper East side -- also a sponsor of the event -- finished the savory portion of the evening with a dry-aged ribeye with green asparagus, bone marrow and sauce au poivre paired with Chase Family Cellars St. Helena Cabernet Sauvignon. The evening concluded on a sweet note, with a peach shortcake with lemon verbena ice cream from Lee, of Riverpark. For those who have missed the extravaganza, the Celebrity Chef Tour will visit Roanoke, Ind. ; Minneapolis; New Orleans; Paris, Ky.; Scottsdale, Ariz.; Kirkland, Wash.; and end in Newport, R.I., for the rest of 2012.